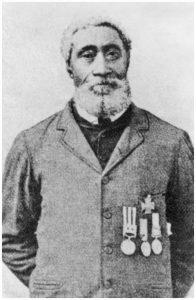 William Hall was the first Black to win a Victoria Cross and a Canadian at that. William Hall was born in Hants Co., N.S., in 1829. His parents were extremely poor; and the boy, showing a great spirit of independence, shipped before the mast in 1844, sailing in a small vessel from Hantsport, the nearest shipping port to his native village. The following six years were spent in the merchant marine of Nova Scotia.Then came the Indian Mutiny, occurring between 1857 and 1859.On 16 November 1857, at the town of Lucknow, British naval guns were brought up close to the Shah Nujeff mosque. The gun crews, of which Hall was a member, kept up a steady fire in an attempt to breach the walls of the mosque. A hail of musket balls and grenades from the mutineers inside the mosque caused heavy casualties for the gunners. Able Seaman William Hall and Lieutenant T.J. Young, who was in charge of the gun crews, were the only survivors of the crews, all the rest having been killed or wounded, and between them they loaded and fired the last gun which won the battle. For this act, William Hall, became the first Black Canadian to be awarded the Victoria Cross. Hall died at Avonport Nova Scotia August 27th, 1904. 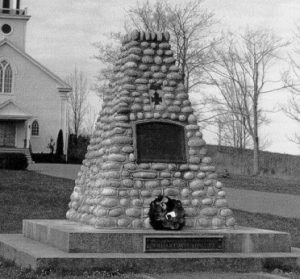 A cairn was erected in his memory to commemorate the heroism of the man.